Is a 1080p HD TV really worth buying? Or is a 720p set good enough for home high-def? Yes, you want an HDTV. Who doesn't? But which is best? 720p or 1080p? With a new generation of 'higher' definition TVs becoming available, consumers in the UK are facing a new HDTV buying dilemma. Do you opt for an affordable 720p resolution (1280 x 720 pixel) HD set now? 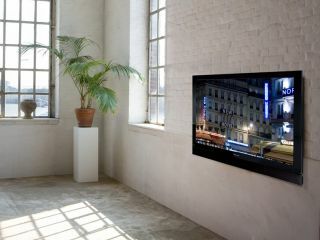 Or one of the new breed of cutting-edge 1080p (1920 x 1080 pixel) screens? In short: is a 1080p HD TV really worth buying? The fundamental specification for HDTV starts with 720 lines. Because of this, almost all HD-ready TVs are geared up for 720-line resolutions and its interlaced variant - 1080i. The marketing blurbs that call 1080p 'full HD' are misleading. 720p is a valid high definition format. It is HD. This is one of the basic requirements for the 'HD-ready' logo. HD-ready TVs have been getting cheaper and cheaper while the new 1080p-compatible screens still come at a hefty price premium. Why pay more for something that might give you hardly any additional benefits for the time being? To date, no HDTV broadcasts are based on a 1080p resolution. So for watching HD programmes on Sky HD or BBC HD, a 720p/1080i TV is all you need. A full 1080p picture would require so much bandwidth to broadcast that it's not likely to appear for several years. Along with the relative shortage of 1080p displays, the vast majority of DVD hardware (DVD is still the most popular optical disc format) only outputs 720p/1080i at best. Again, it tends to cost more to get an upscaling player that handles 1080p. Unless you have a really giant screen - and by this I mean 50-inch or more - then most people can't really tell the difference between 720p and 1080p. What is more noticeable is the difference between interlaced and progressive video. So, stick with your standard HD-ready gear and set it all to 720p. Progressive scan is always superior to interlaced video, except perhaps for very slow moving or static images, where 1080i might be preferable. You can show a 720p source image on a 1080p TV without any problems. It will be upconverted with a simple conversion, causing no side effects. If you simply want the best quality, then 1080p can provide it. Why settle for second best, based on technology that's been around for several years, when you can get something that's state of the art? As average TV sizes get bigger, 1080p can fill a large screen with a truly sharp HD image. Even though it's technically high definition, a 720p image can start to look soft when it's blown up on a massive display. 1080p doesn't suffer from side effects such as jagged or 'feathered' edges caused by interlacing. These problems become more obvious with larger screens, especially if you sit quite close. A 1080p output is included as an option on most new Blu-ray or HD DVD players. One or both of these formats should take over from DVD in due course, so it makes sense to have a TV that's ready to show HD at its finest. If you don't have a 1080p, you won't be able to see your movies in the highest resolution. As digital compression techniques develop, it's feasible that HDTV broadcasts will be able to adopt formats such as 1080p in the future. The latest ( v1.3 ) incarnation of the HDMI socket that connects high definition equipment can even carry up to 1440 lines in progressive scan. Compared to that, 720p is going to look really primitive!